The Community Foundation of Middle Tennessee is now seeking applicants for the 2017 Nashville Fashion Forward Fund Award. Professionals working in all aspects of the fashion industry from designers and photographers to stylists, models, hair and makeup artists, boutique owners and bloggers are encouraged to apply. Detailed instructions for submission can be found at CFMT.org. 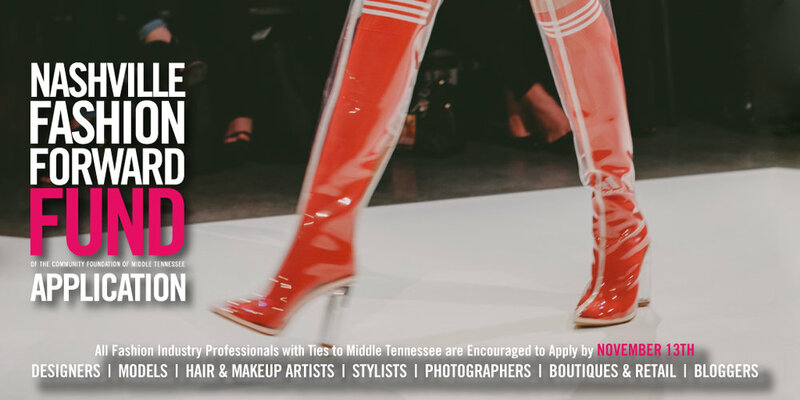 Originally established in 2011, this endowed fund supports the next generation of fashion industry professionals with ties to Middle Tennessee and provides financial awards and resources for experiential professional development opportunities. Past winners include fashion photographer Brett Warren, clothing designers Eric Bornhop, Julianna Bass and Lauren Leonard, accessory designer Ceri Hoover, and creative brand consultant, art director and founder of Pennyweight and ShopGoodwin.com, Elise Joseph. Applications must arrive at The Community Foundation of Middle Tennessee’s office at 3833 Cleghorn Avenue by 4 p.m. CST on November 13, 2017. The award recipient is selected by a committee of the Board of The Community Foundation of Middle Tennessee and will be notified in January 2018.